frontage to enjoy. The home has 800 square feet of living area and is air conditioned. Its a great spring, summer and fall getaway. There is an 80 foot dock to enjoy, picnic table, barbecue grill and patio. Fish outside your front door, pitch a tent in the front yard, bike along the very quiet road, enjoy the local restaurants, try your golf game at six local golf courses. One bedroom has a queen size bed. The other bedroom has a full size bed. The living room could be used to sleep an additional 4 people. It has a couch with a pull out bed that steeps two. Kitchen has a stove, refrigerator. coffee maker, toaster and microwave. All cooking utencils, silverware, plates, dishes and glassware is provided. All linen and bathroom towels are provided. There is a split system air conditioner that will provide you with qient, cool and refrshing air for all rooms. Enjoy the 1,000 acre lake at your doorstep. Canoe, paddle boat and 2 kayaks available for your enjoyment. We had a peaceful and comfortable stay at Donn’s cabin. The place was adorned with rustic and friendly furniture that you’d find at a friend’s ranch home, but with modern updates in the bathroom. We loved having access to Donn’s kayaks to paddle the relaxing Lake Nebagamon, perfectly scattered with friendly boaters of all kinds. If you are looking for a quiet and replenishing escape, there’s no better place in Douglas county to find sanctuary. Loved Loved the location, cabin, and the owners! Definitely going to stay there again! All the things there you need for a wonderful and relaxing time. Fishing was good too :) Thanks Donn and Del! Newly renovated cabin. Donn and Dell wonderful hosts. Donn and Dell were wonderful hosts who made us feel at home. We lucked out with some fantastic weather which allowed us to make good use of the lake, kayaking and heading out on the pontoon as well as bbqing outside. 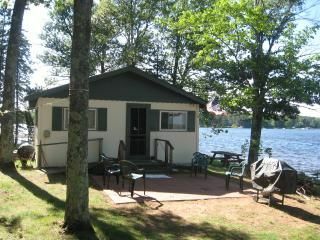 The pictures on the website do not do the cabin justice....you are much closer to the lake than it appears. You get wonderful views of the lake from the living room, dining area and even while doing dishes! Some of the furnishings are outdated, but that suited us well as we had a baby and chocolate lab in tow. All in all a great and relaxing weekend. We would certainly consider staying here again and feel that it was priced quite reasonably. The lake is beautiful, and this small cabin had everything we needed for us to enjoy the week. Thank you, Donn & Dell. Nightly Rate: $125 Weekly Rate: $795 - $895 Monthly Rate: $2000 - $2200 April - May $ 595/wk. June $ 695/wk. July thru August 15 $ 795/wk. August 15 - September $ 695/wk. October $ 595/wk. Monthly rates are also available.